Stephan Balkenhol is an internationally renowned German artist, born in 1957 in Fritzlar. 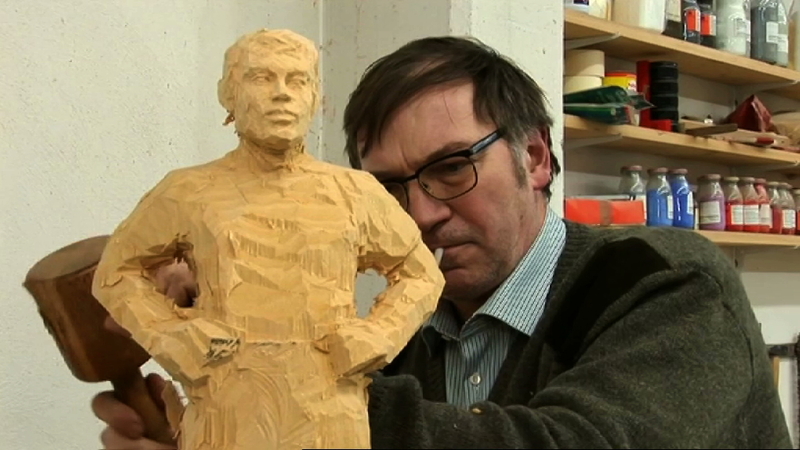 He has been concentrating on the human figure over two decades and began his sculptural process of figurative wood carving in the mid-Eighties – as a response to the abstract, minimalist and conceptual approaches of the Hamburg school of Fine Arts where he studied from 1976 to 1982. The film offers a glimpse inside the artist studio and shows him at work, using a hammer and chisel to gouge some figures out of the tree trunk, leaving the shavings and traces of the tools visible in the wood with its knots, grain ans cracks. We follow him from Karlsruhe where he teaches at the Kunstakademie to Meisenthal in France where he also lives and works. An Interview with Guy Tosatto, Director of the Grenoble Museum, reveals the artist’s complex relationship with figurative art and German History on the occasion of a large retrospective of his work.